Discussions Magazine Music Blog: A PLACE TO BURY STRANGERS/New album due October 6th, 2009! A PLACE TO BURY STRANGERS/New album due October 6th, 2009! A Place To Bury Strangers release their sophomore album, Exploding Head, via Mute on October 6th, 2009. The band had one simple goal during the recording process: "The original idea," says vocalist/guitarist Oliver Ackermann, "was to create the craziest, most f'ed-up recording ever." The result is 43 mesmerizing minutes of pain as pleasure. You'll be checking the levels on your living room stereo from the moment "It Is Nothing" pulls everyone in earshot through a vortex of groove-locked rhythms and back-spun power chords (hammered out by drummer Jay Space and bassist Jono MOFO). You'll be sucked in and blown away by the paranoid android pop of the album's first single "In Your Heart," the gorgeous gate-crashing melodies of "Keep Slipping Away," the Chinese water torture chords of "Lost Feeling," the sputtering percussion of "Everything Always Goes Wrong," the apocalypse now effects of "Ego Death," the sinewy, slightly sinister overtones of the title track, and the firework finale flare-ups of "I Lived My Life To Stand in the Shadow of Your Heart." The collection makes up the band's most realized recording to date. During the Exploding Head recording process engineer Andy Smith (Paul Simon, David Bowie) took the band to "a whole other level" says Ackermann. "I love the interplay and contrasts between something that's pretty and something that's scary," he explains. "Taking listeners to different places—even in one song—is so important, whether it makes them cry or pissed off. If you listen closely, some of the riffs on this record are actually like Ramones songs or '60s bubblegum pop." Called "the most ear-shatteringly loud garage/shoegaze band you'll ever hear" by the Washington Post, A Place To Bury Strangers are now poised to blow minds and speakers alike. 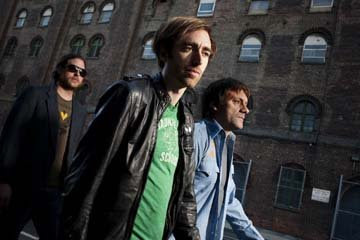 Says London's NME; "The pleasure pain threshold has rarely been more blurred, but rock this ferociously soulful is only good for you if it hurts," as they noted A Place To Bury Strangers as on of the Ten Best Bands of SXSW 2008. Their debut release earned them a "best new music" distinction and enduring support from Pitchfork, and they have toured with the likes of Nine Inch Nails, MGMT, Holy F**k, The Dandy Warhols and Black Rebel Motorcycle Club. In April 2009, A Place To Bury Strangers played the Coachella 2009 Music Festival in Indio CA. Most recently, the Brooklyn based three-piece rocked the shoulder-to-shoulder crowd at The Village Voice's Siren Festival at Coney Island Saturday July 18th. They next embark on a US tour supporting Exploding Head's release this October with support from Darker My Love, Dead Confederate, and All the Saints. The Village Voice calls them "pedal whiz kids," which should come as no surprise as Ackermann builds custom guitar pedals.